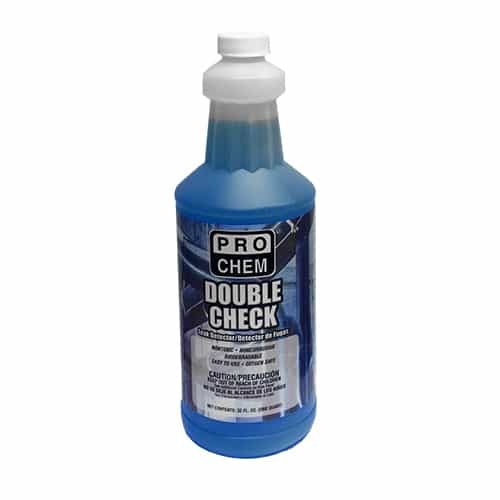 Double Check | Pro Chem, Inc. DOUBLE CHECK has an advanced sensitive solution that is specially formulated to pinpoint even the smallest leaks. It suspends dirt so the particles do not drastically reduce the sensitivity of DOUBLE CHECK. This unique formula allows the product to cling to pipes for extended periods of time. It can be used to locate nitrogen and natural gas leaks. Previously coated surfaces can be rechecked by wetting the area with water. Spray or swab product to thoroughly coat surfaces to be checked. Visually inspect for bubbles. Micro leaks will produce a cluster of small bubbles. All surfaces previously coated can be rechecked by wetting areas with water. Turn on system for 5–10 minutes, then visually inspect for vibration leaks.